I recently had an idea while using the BBC News iOS app. On my original iPhone 3g (Now quite old I must admit) in my experiences it ran pretty horribly, was slow to load and seemed to choke up when scrolling through the different news categories. I use the BBC’s mobile website as well and thought there was a need for something in the middle, between the old school mobile version of the BBC News website and the modern iOS app. It would need be graphically pleasing, fast, platform independent and suitable for touch screen devices but can still be accessed via a web browser, not by using a proprietary ‘app’. So what I’ve developed is something in-between, with most of the core features of the iOS app intact (More to come) – using just web technologies such as PHP, jQuery and the new jQuery Mobile framework. I think its quite interesting given the interest and slight controversy over the BBC app, after its first launch was delayed. In my opinion they should have invested the resources in upgrading their mobile website, using their in house team rather than outsourcing to a third party company. 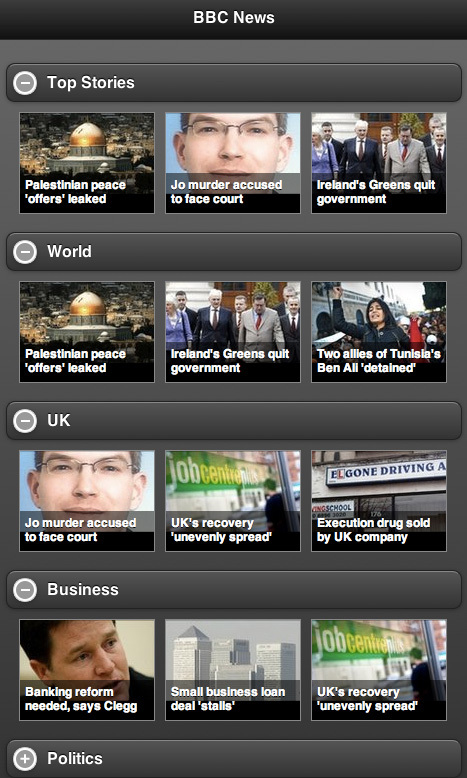 The BBC’s app is closed sourced and only available on apple products such as the iPhone, iPod touch and the iPad. My offering should give the same experince no matter which platform you are on – iOS, Android, Blackberry, Windows Phone 7, Palm webOS or Symbian. Oh and it’ll be open source. I want to get an idea of what people think, and the kind of interest there would be in this (If any). Tis a fun little project to work on either way! Posted in Development and Design, Websites. Tagged with BBC, jQuery.